Just a girl embracing each day with a whisk and a smile. What do you get when you mix Nutella, cinnamon, and sugar? A recipe that has lovingly been dubbed Sugar Sticks. Last weekend, I set out to make an updated version of the cinnamon roll; one that would be oozing with gooey chocolate hazelnut goodness and drizzled with a layer of sweet, cream cheese frosting. Sounds pretty good, right? Well . . . things didn’t quite go as planned, and sometimes you just need to roll with the Nutella slathered dough that’s lying in front of you. I blame the pounds of hazelnut spread layered on this moist dough that resulted in a cinnamon roll refusing to roll. Okay, blame might be too strong of a word; I can’t say I was mad about the amount of chocolate and sugar I was about to consume. But seeing as round cinnamon rolls were no longer in my future, I quickly switched gears and decided to bake this in a log shape instead of the typical cinnamon roll form. Once it came out of the oven, I still drizzled it with the rich cream cheese frosting and cut it into perfectly dunkable sticks. Since this treat is so sweet, it pairs perfectly with coffee or a glass of milk. Enjoy! Begin by preheating the oven to 425ºF. Next, prepare the cinnamon sugar filling by combining sugar, brown sugar, cinnamon, salt, and vanilla in a medium bowl. Cut in butter with a fork until well combined, set aside. In a separate large bowl, whisk together flour, sugar, baking powder, baking soda, and salt. Separately mix the buttermilk, regular milk and 2 tbs melted butter. Once combined, add the wet mixture to the flour mixture. Stir just until combined, then knead with your hands for about 30 seconds. Be sure to flour your hands first as the dough will be very sticky. Once you’ve finished kneading, you’re ready to roll out the dough. On a lightly floured surface, use hands to press dough into a 12×10 inch rectangle. Coat the dough with Nutella leaving about ½ inch of space around the edges. Next sprinkle the dough with cinnamon sugar mixture. Starting with the long end of the rectangle, roll the dough to the opposite end. Roll the dough back and forth to shape it evenly into a log shape. Pinch the ends together and cut off any excess dough. Transfer dough to a non-stick cookie sheet and brush the top with 2 tbs melted butter. Place in the oven and allow to bake for 10-15 minutes. Once the top begins to turn golden, cover the roll with foil and bake for an additional 10 minutes. While the roll is baking, prepare the frosting. Using a hand mixer, beat softened butter and cream cheese until light and creamy. Add in powdered sugar, vanilla, and milk. Mix until well combined. When the roll is finished baking, allow to cool 5-10 minutes before drizzling on the frosting. Next, cut the log into 1 inch thick slices (similar to a biscotti). Store in airtight container for 2 days or serve immediately. Enjoy! Hiding my love of popcorn has never really been an option. First there’s the audible click, click, click of kernels as they fall from the jar and then bounce around atop the pot on the stove. Then of course there’s the freshly popped buttery smell that permeates the apartment. My roommate can attest that popcorn is often my go-to snack (like every night often). So when I found this recipe, my mind was slightly blown. Are you ready for this? My popcorn loving self and I weren’t, so I want to give you fair warning. Okay, here it goes. As the name suggests, these cookies have buttered popcorn swirled into the batter and are topped with sea salt. Oh and don’t forget there are also dark chocolate pieces swimming in every bite. 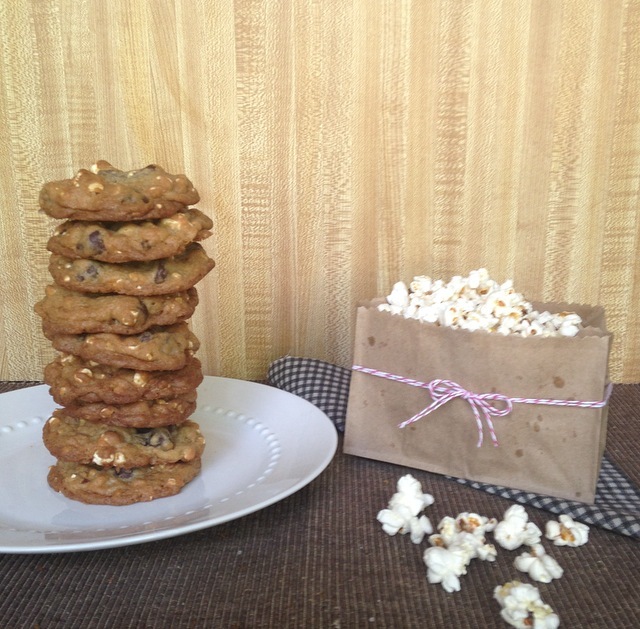 I’ve made dessert popcorn in the past (aka a bowl of popcorn with chocolate chip pieces mixed in…. hello melty, salty, chocolatey goodness!) BUT I never thought to take this idea to the next level and create a cookie. Joy and Deb, hats off to you. Thank you for helping me step up my popcorn game. You may be wondering what in the world does popcorn in a cookie taste like. Well, friends, let me tell you. It tastes a little bit like heaven. The popcorn gives the cookies a slight chew factor, in the best possible way, which is balanced by the ooey gooey center and crisp edges. I went ahead and made these bad boys with stovetop popcorn, but you can also use microwave popcorn, which the recipe actually recommends. Okay, I think that’s enough talking for now. Grab a glass of milk and your favorite movie and get ready to treat yo’ self. I had to give myself a serious self-discipline talk after making these doughnuts. Maybe I shouldn’t have eaten 10 of these in one sitting. But hey, live and learn, right? And aren’t there plenty of sayings about seeing what you can achieve. Oh, they aren’t referring to how many doughnuts you can eat? Pish. Posh. Doughnuts are an accomplishment too. Do: Cut out the doughnuts one by one. If you prep all the doughnut holes before removing them from the counter (like I did the first time) they are more likely to stick and are less likely to hold their shape. Don’t: Assume you’re a frying master. If you have a food thermometer, use it! If not, you can use a wooden spoon to help test the oil. To check if the oil has reached 350°F, dip the end of a wooden spoon in the oil; when the oil is ready for frying it will begin to bubble around the spoon. The doughnuts really should take about 30-45 seconds to cook. If it’s taking longer or less than this, you need to adjust the cooking temperature. If the oil is too hot, the outsides will cook too quickly while the inside remains doughy. So. HOT. Can. barely. think. It’s almost 90 degrees, AND I’m inside. My face is pressed as close to my fan as it can possibly go, too fatigued to even shout words into the blowing air stream and transform my voice as I once did when I was a child. Okay, thinking cap on. I need to bring snacks to book club later in the evening. What can I make that does NOT require me turning on my oven. Open, shut, open, shut. I flip through the cupboards and pull out a hodgepodge of ingredients. Slivered almonds, chocolate chips, powdered sugar. Think. Think. Think. Knowing that these three items would complement one another (I mean, chocolate goes with everything), I began searching the web to see if I could get some no-bake recipe inspiration. I came across this lifesaving recipe. Seriously, these treats are so delicious, so easy to whip up, and most importantly do not require turning on your oven. Seasons and Suppers…. thank you! thank you! thank you! If you’re in a heat wave like I was or are just looking for an easy way to satisfy your sweet tooth, head on over to Seasons & Suppers for the recipe on how to make these Double Chocolate Almond Florentines. There’s not always a middle ground when it comes to food; there are some items that you either love or hate. I’m pretty sure marshmallows fall under this group, if we can even classify them as food. I happen to be a heavy hitter in the first category, like marshmallows are sitting in a mason jar in my cabinet-could eat them all day-even eat them as a post workout snack-don’t get me started on s’mores-love them kind of person. Ever since my dorm days in college, homemade rice krispies treats have been one of my go-to snack recipes. They take about 5 minutes to make and don’t require turning on the oven…. which can be a summertime savior. There are so many variations on the classic rice krispies treat that combinations are endless; I tend to drizzle mine with white chocolate and top with rainbow sprinkles. They just look happier that way! If you’re heading to a picnic or a summer concert at the zoo (*cough*cough, like I was), these treats can be easily wrapped up in individual servings. Place them in the center of a piece of plastic wrap and fold until the treat is completely covered. To seal the treat, twist each end and finish by adding a ribbon. Voila! *6 cups is the recommended amount but if you want your treats more gooey, opt for less krispies; for a less gooey treat, add in more krispies. Place the marshmallows (yes, all of them) and butter in a large microwave safe bowl. You’ll later be adding the Rice Krispies to this bowl so make sure you choose one that will have enough space for all ingredients. Microwave for 1 minute and then stir; continue to heat and stir until marshmallows and butter are completely melted (about 1-2 more minutes). Once the marshmallows and butter are melted, gently fold in half of the Rice Krispies. I like to add them in sections so they don’t go flying when I attempt to stir the mixture. Once combined, add the remaining krispies. You can choose to stir with a spoon or spray your hands with non-stick cooking spray and use them to mix. When the marshmallows, butter, and rice krispies are combined transfer to a greased 13x9x2 inch pan. To finish off these treats, drizzle melted white chocolate on top and then add the sprinkles. Cover and place these treats in the fridge to cool.